Abcam’s IgD Human ELISA kit is an in vitro enzyme-linked immunosorbent assay (ELISA) for the quantitative measurement of IgD in Human samples. In this assay the IgD present in samples reacts with the anti-IgD antibodies which have been adsorbed to the surface of polystyrene microtitre wells. After the removal of unbound proteins by washing, anti-IgD antibodies conjugated with horseradish peroxidase (HRP) are added. These enzyme-labeled antibodies form complexes with the previously bound IgD. Following another washing step, the enzyme bound to the immunosorbent is assayed by the addition of a chromogenic substrate, 3,3’,5,5’-tetramethylbenzidine (TMB). The quantity of bound enzyme varies directly with the concentration of IgD in the sample tested; thus, the absorbance, at 450 nm, is a measure of the concentration of IgD in the test sample. The quantity of IgD in the test sample can be interpolated from the standard curve constructed from the standards, and corrected for sample dilution. Little is known about the normal function of IgD, and few clinical signs or symptoms are associated with its absence. Individuals with low or absent levels of IgD do not appear unusually predisposed to infections. In mice, IgD may substitute for some functions of IgM when IgM is absent. IgD is expressed on peripheral B cells and is used as a pan B cell marker. Our Abpromise guarantee covers the use of ab157708 in the following tested applications. 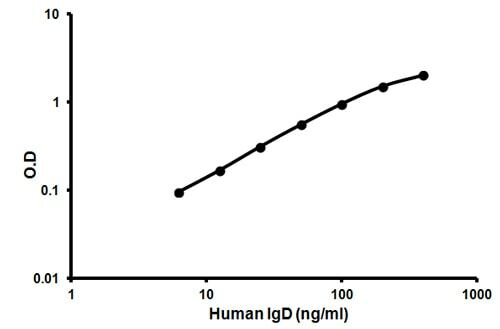 Representative standard curve using ab157708 IgD Human ELISA Kit. ab157708 has not yet been referenced specifically in any publications. Publishing research using ab157708? Please let us know so that we can cite the reference in this datasheet. Does the microplate in the IgD ELISA ab157708 consist of multiple strips or a single plate? The IgD ELISA ab157708 comes with 12 x 8 strips in a frame, not a single solid plate.